Ukeme Ekpoh turned in several good sprint performances at the Pioneer Invitational, ranging from 100m to 400m. Arizona Milesplit Photo. The 4th annual Pioneer Classic held at Pinnacle HS in Cave Creek took place on Saturday. It was a hot and windy date, but the competition was still fun to watch. “To be real, I was thinking about my feet hurting cause the track was so hot," recounted girls 1600m winner, Megan Reniewicki, of the conditions. Despite her burning feat she was able to prevail over Kelly Shock, Jesselyn Bries, and Paige Hildebrandt in a four way sprint. The wind and heat weren't the only distraction. Many athletes scratched afternoon finals in lieu of prom festivities. Not all athletes let the prom bug get to them. “Prom is not effecting track for me," explained Matthias Mciver of Cactus Shadows who won both the shot put and discus competition. However he did add, “There was a little less competition than I expected, so it was harder to push yourself." That may have been true in the discus as he dispatch Weston Wright of Scottsdale Prep by almost ten feet, however teammate Justin Saxe was just a couple of inches behind him in the shot. “It's fun going back and forth, today he barely got by me but it was fun," Justin commented of the days competition. Even though the total number of athletes were down, the pressure was still there since the Pioneer Classic is a qualifying meet. Arcadia's Shekinah Green won the meet but feel just short of her personal record. “Sometimes I get anxious in competition, and I just wasn't feeling it today. I need to work on my back kick." Some winners like Edwards Henderson let the competition fuel them to personal bests though. He set a PR en route to winning the 300H. Not only was his performance a PR, but his signature flailing form carried him to a school record. Another hurdle victory of note came from Adam Turner of host Pinnacle High School. “It was great to protect the home track," stated Adam but he made it clear he wants more. “I want to bring home some wins this year for the team and get points at state." Another Pinnacle sprinter that protected their home turf was Cules Rose who wanted to put on a show for his future football coaches, “I just wanted to impress them!" 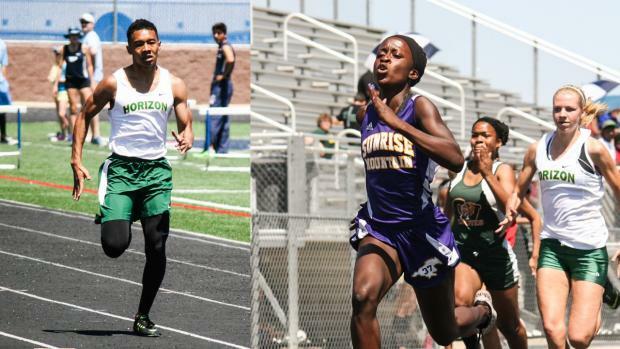 Another couple sprinters who turned in impressive performances were the 200m winners, Maj Williams of Horizon and Ukeme Ekpoh of Sunrise Mountain. Both of them of are sophomores and are just getting used to winning big meets. However Ukeme focuses more on setting PRs. “It's nice to win, but I don't try to win. It is more of an accomplishment to set a PR." While she didn't get a PR due to the headwind, her male counterpart notched a season best time despite the conditions. Maj who had scratched from the 400m finals to conserve energy, easily dispatched Terry Griggs of Sandra Day O'Conner in a 22.61 effort. He hopes to be in the running for the podium at state, though knows it will be tough to run down Paul Lucas, “I am excited for state because I look up to Paul, it will be cool to get to race him." In his absence the 400 was swept by Sandra Day O'Conner duo Oscar Mills and Quinton Bankston. Quinton has great appreciation for his teammate. “Oscar started track last year, before he came I was supposed to be the #1 400m," Quinton explained, “Oscar makes us better, he works harder than anyone." Oscar's work ethic must rub off on more than just Quinton as their 4x400m team also closed out the meet with a strong win. The 400 guys weren't the only relay from Sandra Day O'Conner that took home a win. After getting out to a big lead on the first leg the girls 4x800m didn't let anyone within sniffing distance. Brooklyn Edwards explain, “I knew I couldn't slack because I wanted my team to keep the lead." Teammate Analise Nicholson had similar feelings, “It was challenging but it was exciting to lead the race." While leading the race is one way to shut the door on the competition, a strong kick is another way to impress fans. In the boys 800 and 1600 Isaih Feul of Independence tried that tactic. In the mile it didn't work for him as another front running Hawk, Sebastian Kwit, put enough cushion between himself and the Glendale harrier. “I knew was ahead," Isaih explained afterwards, “But I let him slip some on the third lap. That was my bad." The 800m was a different story. Isaih was bound and determined not to get gapped like that again. Eddie Weatherman was the athlete from Sandra Day O'Conner that Isaih had to catch this time, but he could not get the same lead on Isaih that Sebastian had in the mile. “I know I could catch him we he went," recounted Isaih, “I knew I had energy saved because my first lap was slower than what I am used to." Despite the slow start he was able to manage a 2:00 besting Eddie by two seconds. All in all it was a good day, even if the conditions weren't ideal for running. Arizona Milepslit was on sight and did get some good pictures. Take time to check them out right here. Results for this meet can be found here. If you click on your name (or your friends name, or your child's name) it will take you to their athlete profile. College coaches look at athlete profiles. Take time to claim your athlete profile and make it look spiffy.